Going from higher end to lower end, another makeup item I'm currently stalking, is the newly released Models Prefer Sweet Shadows tin. It looks like a chocolate box, how can I not want it! 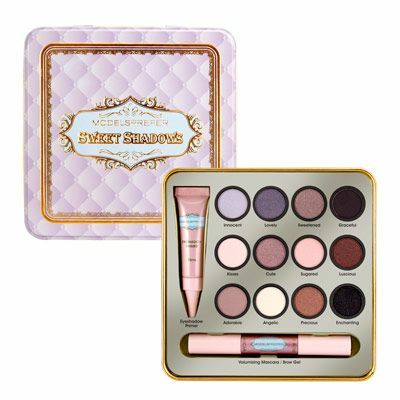 I've heard a few comments that the palette might've been 'inspired' by Too Faced palettes - what do you think? I just want it because the colours are so pretty and girlish - very much colours I like to wear. And it's a very reasonable price of $15. I don't know whether it was never sent, delivered to the wrong address, or nicked, but I'm disappointed it never came. I used the refunded money to buy a few things from the new XOXO Minnie Collection instead! That cheered me up, lol. You won't believe this, but I think I might finally be growing up. There's no stronger indication then the fact I've been obsessed with finding a signature fragrance these past few weeks. I recently purchased Juicy Couture's Viva La Juicy, my very first perfume, and am just loving how grown up I feel when I spritz it on. However, I've also got my laser beam eyes focused on one other perfume I'm dying to add to my dressing table. And the last of my beauty wish list items is the MUK stick curler. It's been on my wish list a few months already, but before I can fork out the 90+ dollars for it, my paypal account always ends up in dire straights, so I always push the purchase back. Moving along to my fashion wants, and another obsession that's been haunting me is the want for a macaron necklace! Every one I've found is a little pricey for my taste, since they're usually hand-made. I spied this one on etsy - it's sooo pretty! It kind of makes me hungry too, lol. Squeee! I *love* this dress! I happened across a dress store called Bonne Chance Collections and just fell in love with the entire shop. There are no better words then Cute or Pretty to describe the dresses. And last, but not least, I'm obsessing over this leopard onesie! You know I love my leopard prints, haha. It looks so comfy too. So this is my wishlist for nowt - I doubt I'd be able to get everything here, but I can dream, can't I? What's topping your wishlist at the moment? That's a lovely wishlist and you mentioned a lot of cute and interesting things !!! Hehe, I think I'm going to pick up that palette soon! I haven't had sniff of Chanel before - maybe it's more a mature scent! I saw Benefit post the Christmas packs on their Instagram and oh my gosh, I want them all! Marc Jacob's Honey is amazing! Definitely keep an eye out for a promotion. I'm kind of torn between Daisy and Honey! I'll have to put Daisy on my next wishlist I think! $15 is pretty fab - hope the quality's nice too! Benefit's doing a good job tempting me! Yeah, the MJ perfumes are pricey - but I'm desperately hoping for a Xmas promo soon! Thanks kat :) I've been stalking my two closest Pricelines for the MP palette, but yet to see them, so I might have to travel a little further to get my hands on it! Aww, that's sweet of you to say - and thanks again for the nomination! It's a really pretty palette - especially for Autumn! haha there is alot of items on my wish list just like yours! I'm hoping there'll be a nice X-mas promo - I really want to get my hands on it! Aww, thanks Mindy! I'm utterly obsessed with the onesie haha. Yeah, after reading a few reviews, I wasn't really in love with some of the shades, but I thought the red one was quite gorgeous and unique. But I'm happy to have used the refund to get the Minnie collection instead! Hehe, even if our wishlists are long, we can still dream! Oh yeah - I heard tomorrow and Wednesday Priceline's doing 40% off fragrances! I guess I'm going shopping tomorrow! Great picks! I have the MUK curl stick and it's fantastic! I also have Honey and love it to bits! I'm hoping the Xmas period coming up will be fruitful for some good sales! Hehe, the Benefit packs are so cutely packaged - so tempting! the mocking bird dress is soooo cute! and i've heard so much about honey but i haven't had a chance to sniff it yet :C marc jacobs as the best scents!